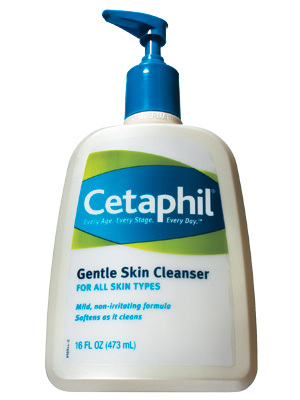 CETAPHIL, Gentle Skin Cleanser is a non-foaming cleanser that can be used with or without water. With water - Apply and massage gently, then rinse away. Without water - Apply and massage gently, then remove with soft cloth/tissue. For the last five months I have been using this cleanser. Before I bought it I did a bit of a research, and as it had good reviews I decided to buy it. I have a combination skin and my cheeks tend to be most of the time pink. Not my favourite look I must add. The main reason why I am so happy about CETAPHIL, Gentle Skin Cleanser is the fact that my skin looks so much more calmer and my cheeks do not feel as dry as they use to. This product cleanses without stripping away the skins natural protective oils and does not disturb the skins pH balance. Leaves no residue or tightness and it has smooth consistency (like a milky lotion) and goes on like a dream. CETAPHIL, Gentle Skin Cleanser is suitable for all skin types (because of its simplicity and non-harsh chemical build up) and it comes recommended by dermatologists and pediatricians. Its formula is gentle enough for everyday use and as a compliment for prescription treatment for acne, eczema, rosacea and psoriasis. CETAPHIL is one of many lines/brands of skincare products from Galderma Laboratories(www.galderma.com). Their original formula has been around for over 60 years. CETAPHIL, Gentle Skin Cleanser is sold worldwide and in U.K it can be found in Boots and Lloyd's pharmacies. I really like this cleanser and will buy it again when I run out of it. Its simplicity did impressed me. I would highly recommend it as it works as well as some high end products with a nifty price tags. Welcome to my blog. I am a Croatian living in the UK. I'm in LOVE with all things cute and like to blog about beauty and lifestyle.